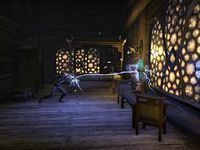 Help an Argonian secure her freedom. I met an Argonian named Delves-Deeply in the ruins of Quendeluun. She's asked me to help secure her freedom. This page was last modified on 14 August 2017, at 21:42.